The couple behind High River-based Highwood Crossing, known for their grains, cereals and flax oil, has been named one of 20 up-and-coming food artisans in the country by ACE Bakery and a panel of chefs and writers. 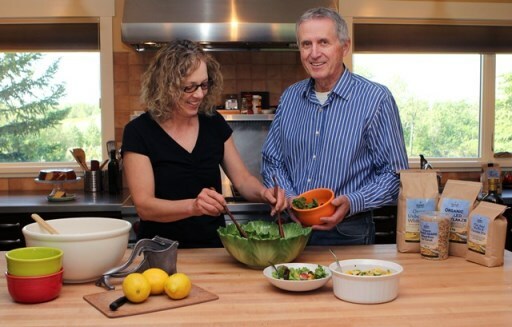 Owners Tony and Penny Marshall have been recognized for their cold-pressed flax oil and will now take part in the Artisan Incubator this summer in Toronto where they will learn more about finance, marketing and business planning and be honoured at a showcase for all the artisans. The incubator, created by ACE Bakery in recognition of the mentoring the founders received when they were starting their business 20 years ago, is aimed at giving culinary artisans national exposure as well as business insights to help them grow their own companies. A panel of “tastemakers”, including Charcut’s John Jackson and Connie Desousa, selected the 20 artisans who will travel to Toronto in June. Also on the panel were Chef Lynn Crawford of Food Network Canada’s Pitchin’ In and Toronto’s Ruby Watchco and Canadian culinary activist Anita Stewart. Joining the Marshalls will be Andrew Shepherd of Vancouver Island Salt Co. with his fleur de sel, Over the Hill Orchards’ Dean and Sylvia Kreutzer with their Dwarf Sour Cherry Spread and numerous others. For a complete list of the artisans, click here.